Hands-on experience, mentoring from seasoned professionals, and top-notch facilities prepare our students for fast-changing fields that require excellent communication skills. The department offers the following majors/concentrations. Our graduates work as writers, editors, reporters, production specialists, and public relations professionals. They’re involved in web development, the entertainment industry, and a variety of related fields. A new concentration for digital storytellers who dream of becoming the next YouTube sensation, Nextflix producer, short film director or documentary filmmaker. Today’s journalists must be well-rounded individuals who are practiced in the art of storytelling regardless of the medium. Writing, research, organization, ethics, and accuracy continue to be essential for journalists of the 21st century. The multimedia journalism program at Wartburg provides an active laboratory for students to apply cornerstone skills in a real-world setting. Students can enhance their educational experience with a variety of student-operated media outlets and organizations. Organizational and Public Relations professionals are responsible for developing and managing comprehensive integrated marketing communication strategies and campaigns. They manage all components of communications messaging, from creating and managing brands, to implementation, to measurement. Successful practitioners must be able to make sure that all communications efforts – from PR, to marketing, to multimedia, to social media – are all working together to produce the desired results. Students will learn how to utilize public relations, advertising, brand management, and design together, to form cohesive communication strategies for others. Critique by professional organizations is an integral component to the educational experience in the Department of Journalism & Communication. Without fail our students continue to impress those in the industry as well as their peers from other institutions during annual competitions. Wartburg has made an impression with the Associated Collegiate Press and received several accolades including an Online Pacemaker Award, Best in Show for weekly tabloid and Best in Show for multimedia package. The Iowa Broadcast Association has also given a nod to Wartburg including Overall Excellence for Wartburg Television as well as numerous awards in other categories such as first place honors for KWAR sports coverage, best newscast, spot news coverage, features and political coverage. The Iowa College Media Association has recognized the impeccable storytelling that our students do in news, sports casting, long form documentary and public service promotions. 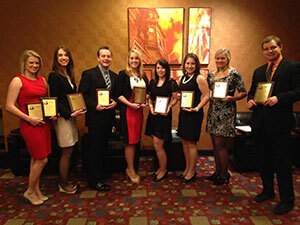 The Midwest Broadcast Journalists Association (formally known as NBNA) is no stranger to student work from Wartburg. The list of awards and accomplishments is overwhelming and ranges from awards for general reporting to sports play-by-play and documentary work. The Department of Journalism & Communication belongs to the Society for Collegiate Journalists, one of the oldest organizations for student journalists, and is no stranger to success at their annual competition often sweeping categories altogether. Wartburg is a relative newcomer to the National Academy for Television Arts & Sciences annual competition but has already become a major player with more nominations than any other institution in the last few years and bringing home several crystal pillars. Students from any major can work with campus media and department organizations. These organizations provide a hands-on learning environment to complement what students learn in the classroom. KWAR radio station broadcasts online around the world and locally at 89.9 FM. The station has won numerous awards for news and sports coverage. Knight Vision is Wartburg’s live and on-demand video-streaming network, covering sports, music, worship, news, and special events. This co-curricular program also is open to non-majors. Knight Vision Films is the production label under which documentaries, short films, and experimental work is produced. Students work on projects associated with classes they are taking as well as partnering with professors on special projects. Knight Vision News is a student-run news station covering campus, local, and national news. The staff have dominated many regional competitions, including five Upper Midwest Regional Student Production awards from the National Academy of Television Arts and Sciences. PRSSA provides students opportunities for professional development, networking, scholarships, public relations competitions, and career assistance. The Tower Agency is a student-run public relations firm that provides hands-on experience with clients. The Wartburg Players theatre troupe has performed at the Kennedy Center American Theatre Festival twice. The Trumpet is the student-run campus newspaper and covers campus and local news. The Trumpet has won numerous regional awards. Lambda Pi Eta (LPH) is the National Communication Association’s official honor society at four-year colleges and universities. More than 250 alumni continue involvement with Wartburg communications through membership in the Society for Collegiate Journalists as well as assisting students to acquire internships and professional positions. The McElroy Center is designed to encourage student interaction with faculty members and other students. Hands-on learning with the latest technology. WORTH IT. Wartburg graduates find satisfying jobs and are admitted into top graduate and professional schools. Wartburg alumni can be found in all 50 U.S. states and over 70 foreign countries. Below is only a sample of the types of positions Wartburg graduates from the Journalism and Communication Department have had in the past. Sports Reporter/Editor, Worthington Globe, Worthington, Minn.
Director of Student Engagement, University of St. Thomas, St. Paul, Minn. Associate Director for Marketing, Evangelical Lutheran Church in America, Chicago, Ill.
Singer, Songwriter, JR Baxton Entertainment, Atlanta, Ga.
Film Editor, Whitehouse Post Productions, Chicago, Ill.
TV Anchor, WHEC, Rochester, N.Y.
Senior Vice President/Creative Director, Leo Burnett, Chicago, Ill. Feature Producer, ESPN, Bristol, Conn.